Background: This work was to investigate the effect of different doses of hydrocortisone (HC) on rats with septic encephalopathy. Material and Methods: Wistar rats of clean grade, 5-6 weeks old, were randomly divided into Lipopolysaccharide (LPS) group, high-dose hydrocortisone group, medium-dose hydrocortisone group, low-dose hydrocortisone group, and sham group (n=10). Except sham group, rats of other group were injected LPS, 25 mg/kg, i.v. 6 hours later, neuron-specific enolase (NES) in serum and brain water content were tested, and pathological changes were observed by light microscope and electron microscope. Results: Compared with sham group, LPS group demonstrated significantly higher levels of serum NES, brain water content and pathological scores (P<0.05). Different doses of HC ameliorated the injury induced by SE to different extent. Conclusion: HC decreased serum NES, lessened brain water content and relieved pathological changes of brains, which indicate that HC is likely to protect brain injury caused by SE; besides, low dose of HC has the best efficacy and high dose of HC has the worst efficacy. LPS, Septic encephalopathy, Glucocorticoid, Rats. Septic encephalopathy (SE) defined by Bright in 1827 is a common disease in intensive care unit. The pathogenic mechanism of SE is not explicit. SE is considered as an inflammatory brain dysfunction syndrome without primary central nervous system inflammation [1-3]. It is reported that Glucocoticoid (GC) inhibited inflammatory mediators and inflammatory cells, stabilized lysosomes, and restored bloodbrain barrier. However, it is controversial that whether GC can protect or worsen brain injury. The effect of different doses of GC on brain injury is unclear [4-8]. 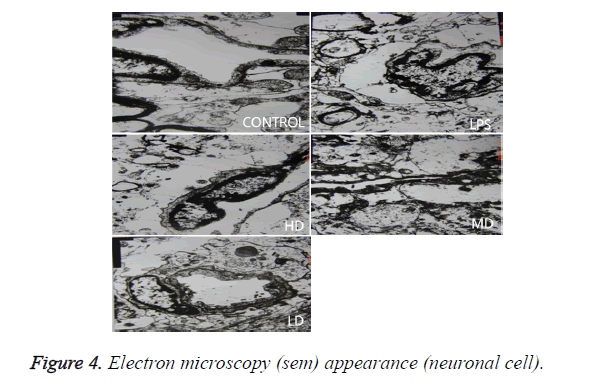 This work applied LPS to induce SE model to investigate the effects of hydrocortisone on serum neuron-specific enolase (NSE), brain water content and brain pathological changes. This work was to investigate the effect of different doses of hydrocortisone (HC) on rats with septic encephalopathy. Male Wistar rats, 160-180 g, 5-6 week old, were provided by Experimental Animal Center of Chinese Academy of Medical Sciences. LPS (Escherichia coli O55:B5), Sigma, L2880, Lot number 024k4067. Elisa kit of rat NSE, Market, was purchased by Dalian Panstate Chemical Technology co., LTD. Rats were housed in a temperature-controlled environment (18-22°C) with a 12 h light-dark cycle and allowed free access to food and water before the experiment. 12 h before experiment, rats were fasted and allowed free access to water. Rats were anesthetized with 10% urethane, 1 ml/kg, i.p. Under anesthesia, right groin were cut to expose tissues, muscles and arteria cruralis. Cannula were inserted into arteria cruralis to monitor mean arterial pressure (MAP) through transducer connected with 404-1 monitoring instrument; LPS and HC were given through the femoral vein of the same side. LPS were administered at the dose of 25 mg/kg, then monitored MAP per 15 min. When MAP was lower by 20% of the normal value, the model was successfully established, which MAP is the shock point. After that, MAP was recorded per 30 min until the cannula was blocked. After model establishment, 50 rats were divided into 5 groups (n=10): HD group: rats were given HC (100 mg/kg) via femoral vein; MD group: rats were given HC (50 mg/kg) via femoral vein; LD group: rats were given HC (5 mg/kg) via femoral vein; LPS group (25 mg/kg) isovolumetric normal saline with HC via femoral vein; sham group: isovolumetric normal saline with respective solution via femoral vein. The volume of GC and LPS was 2 mL. Drug was administered at the shock point. First, Serum sample: 6 h after the model, 0.8 mL blood was drawn by femoral vein and then centrifuged at the speed of 2500 rpm for 5 min, and the serum was stored at -70 °C for serum NSE analysis by ELISA. Second, samples for pathological analysis: After rats were sacrificed, brains were collected. The right hemisphere was used for water content test and the left hemisphere was immersed in 4% formaldehyde for 4 days. Then tissues were dehydrated, embedded by paraffin and then cut into 5 μm slices for HE analysis. The scores of pathological changes were as Bogdansk (shown in Table 1) . Third, brain water content analysis: The right hemisphere was weighed (wet weight), and it was dehydrated in 80°C until the weight is still (the difference is within 0.2 mg), then the brain was weighed (dry weight). The brain water content (%)=(wet weight-dry weight)/wet weight × 100%. Fourth, two left hemisphere samples in every group were immersed inglutaraldehyde for electron microscope examination. Table 1. Brain pathological scores. The experimental results are expressed as ͞x ± s. Intra-group variance was analyzed by t-test and inter-group variance was analyzed by one-way ANOVA using SPSS 11.0 and P-value of less than 0.05 was considered statistically significant. When variance is equal, Least-significant difference and Student- Neuman-Keuls are applied. When variance is unequal, Tamhane’s T2 is applied. Except sham group, the normal MAP and MAP in shock point of other groups had significantly difference (P<0.05). 1.5-2 h after LPS was administered, MAP was decreased by 20% of the normal value (P<0.05). The MAP of sham group maintained the same level during the whole experiment (shown in Table 2). *vs. sham group P<0.05, #vs. normal value P<0.05. Table 2. Changes of MAP (mmHg) in different groups. Compared with sham group, brain water content, serum NSE concentration, and pathological scores were significantly increased (P<0.01). HD group had no difference with LPS group (P=0.242>0.05). LD and MD group decreased the levels significantly in comparison with LPS group (P<0.05). The values of MD had no difference with those of LD (P=0.046<0.05). All HC groups had significantly lower level of serum NSE than LPS group, and LD group owned the lowest level without difference with HD or MD group. The inflammatory response scores of LD and MD group were significantly lower than that of LPS group (P<0.05); inflammatory response scores of LD group had no difference with sham group (P=0.118>0.05). The inflammatory response had no difference with LPS group (P=0.118>0.05). In comparison with LPS group, LD group and MD group had significantly lower neuronal injury scores (P<0.05). 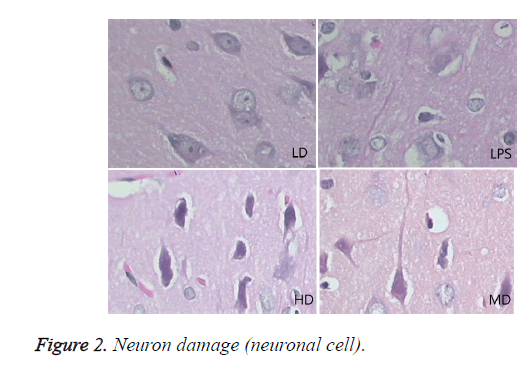 HD decreased the neuronal injury scores of LPS insignificantly (P>0.05). Compared with LPS group, LD group and MD group demonstrated with lower vessels scores (P<0.05) (shown in Table 3 and Figures 1-3). Table 3. Serum NSE, brain water content, pathological evaluation. Figure 1. Inflammatory response (neutrophil cell). Figure 2. Neuron damage (neuronal cell). Figure 3. Vascular reaction (neuronal cell). In LPS group, BBB was destroyed, endothelium was swollen, thrombosis in vessels was observed, basement of vessels was swollen and mitochondria in neuronal cytoplasm were distorted. In sham group, endothelium was intact without vacuole and swelling. The characteristics of HD group were similar with LPS group. 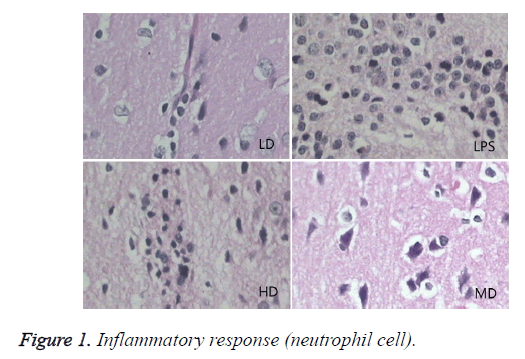 LD group had a little neuronal swelling and BBB dysfunction (Figure 4). Figure 4. Electron microscopy (sem) appearance (neuronal cell). It has been reported that SE induced the up-regulation of TNF-a, IL-1, IL-2, IL-6, INOS, and adhesion cytokines in brains. These inflammatory cytokines recruited neutrophil and monocytes to infected area. Microglia differentiated to macrophages after the state of activated microglia and reactive microglia when central nervous system was infected. Activated microglia has bigger soma and shorter protuberance. Reactive microglia appear as ball without protuberance, sometimes appear as columnar or amoeba. Reactive microglia has the same function with macrophage, and it can phagocytosed debris and infection sources [9-13]. Endotoxin (LPS) activates microglia through two mechanisms: (1) Macrophages induce brain microvessel to induce Arachidonic Acid (AA), then AA in the parenchyma affects microglia through IL-1. The mRNA of AA receptor was proved to exist in brain endothelium . (2) Cytokines released by macrophage or microglia in choroid plexus enter cerebrospinal fluid (CSF), and they may enter parenchyma to activate microglia. In vitro study showed that TNF-α and IL-1β could activate microglia , and TNF-α and IL-1β in parenchyma and CSF were up-regulated in SE . This study investigated the brain inflammatory response by injecting LPS peripherally, and found that activated microglia or reactive microglia took part in this process. The inflammatory cells infiltrated in to brains, disintegrated, and released enzymes that liquefied tissues, which led to focal abscess. Sharshar found that micro abscess formation is the possible pathologic factors of SE, because micro abscess can not only directly injure neuronal cells, but also indirectly damage neuronal cells through inflammatory mediators [17,18]. Studies of imaging had the consistent results. Finelli observed the characteristics of brain of SE by MRI in a SE patient and found that FLAIR in bilateral basal ganglia, cerebellum, brainstem and temporal lobe were abnormal . Autopsy confirmed that bilateral basal ganglia had infarction softening lesion, and caudate nucleus had decolonization. Besides, infarction existed in the neuronal necrotic lesion, accompanied with acute inflammatory response, and the injury was similar with abscess [17-19]. After healthy volunteers were injected LPS, their CBF declined significantly , and the microcirculation was damaged. Animal experiment found that 8h after swine peritonitis sepsis vessels around cortex had significantly swollen; the foot process of astrocytes was broken and was separated with endothelium . Red cells exudates and micro-thrombosis formation were related with decreased blood flow speed, BBB dysfunction and coagulopathy. This study found there is red cells exudates and micro-thrombosis formation in brains. All above injury will limit the transport of oxygen, nutrients and metabolites between brain and blood, which will disturb homeostasis of brain. This study demonstrated that SE induced swollen cerebral blood vessel, BBB dysfunction, excessive inflammatory response, neuronal death and mitochondria injury. Low dose of GC can ameliorate brain inflammatory injury and restored neuronal injury, but high dose of GC cannot improve the injury induced by SE. GC is an anti-inflammatory agent of endogenous broad spectrum through regulating the production and activity of cytokines. However, the therapeutic effects of GC in SE are still controversial. Bbecky A. hypothesized that high dose HC worsened brain injury via excitatory amino acid . Meanwhile, Klaus Dinkel found that HC relieved hippocampus cell injury in encephalitis . There were evidences that proved GC worsened cerebral infarction and encephalitis induced by HIV [5,6]. Besides, Zysk observed that Dexamethasone decreased the injury caused by encephalitis . GC owned permissive action, inhibitory function, stimulatory function and preparatory function. The former three functions belong to regulatory ones and the latter one is the reaction of the stimulation. Cortisol at the basic level demonstrates permissive action; 1h after stress, cortisol increases and has inhibitory function and stimulatory function. The former one maintains the defense reaction induced by stress to some level and prevents the over-defense reaction; the latter one enhances the reaction caused by stress and reverses the inhibitory function . Many studies proved that the effects of GC varied at different doses , the effects and sensibility of GC varied in different tissues . The inhibitory function of high dose GC covers the enhancement of immunity by GC and excessive immunity inhibitory effect occurs, which leads to the neutralization of the whole function or even harmful effects . It was believed that the side effects of cortisol were due to peripheral cortisol resistance or related to RAI . The possible mechanism of peripheral cortisol resistance is GR abnormity. The less GR, more tissues collapsed, and higher mortality [26,27]. Therefore, the level of GR and its affinity is the key point to exert the effects of GC. During SE GR decreases, therefore, replenishment of exogenous GC properly increases cortisol level, which is beneficial to restore stress response . Different kinds of cells have various level of GR [28,29]. The high level of GC in plasma down-regulates GR. The phosphorylation of GR decreases the level and the activity of GR . The genome of GR demonstrated that GR has the domain down-regulating gene expression that is dependent of hormones . Therefore, the excessive amount of GC decreases GR. It was reported that Dexamethason inhibited the expression level of GR time-dependently and concentrationdependently in vitro . Therefore, excessive GC may not have high efficacy of anti-inflammation for the inhibitory effects of GR . It was proved that low dose HC increased serum TNF-α and IL-10 via immuno-suppression, and lessened inflammatory response, which showed that HC had supportive therapeutic efficacy to infected shock . This study revealed that low dose HC ameliorated the brain injury induced by SE via relieving the brain edema, inflammatory response, neuronal injury and vessel injury. We speculated that HC protected brain injury in SE by up-regulating glucocoticoid and inhibiting inflammatory response. Papadopoulos MC, Davies DC, Moss RF. Pathophysiology of septic encephalopathy: a review. Crit Care Med 2000; 28: 3019-3024. Bogdanski R, Blobner M, Becker I. Cerebral histopathology following portal venous infusion of bacteria in a chronic porcine model. Anesthesiology 2000; 93: 793-804. Razvi SS, Bone I. Neurological consultations in the medical intensive care unit. J Neurol Neurosurg Psychiatry 2003; 74: 16-23. Dinkel K, MacPherson A, Sapolsky RM. Nove glucocorticoid effects on acute inflannation in the CNS. J Neurochem 2003; 84: 705-716. Adachi N, Chen J, Liu K. Examethasone aggravates ischemia-induced neuronal damage by facilitating the onset of anoxic depolarization and the increase in the intracellular Ca2+ concentration in gerbil hippocampus. J Cereb Blood Flow Metab 1998; 18: 274-280. Yusim A, Franklin L, Brooke S. Glucocorticoids exacerbate the deleterious effects of gp120 in hippocampal and cortical explants. J Neurochem 2000; 74: 1000-1007. Zysk G, Brück W, Gerber J. Anti-inflammatory treatment influences neuroal apoptotic cell death in the dentate gyrus in experimental pneunococcal meningitis. J Neuropath Neur 1996; 55: 722-772. Stein-Behrens BA, Elliott EM, Miller CA. Glucocorticoids exacerbate kainic acid-Induced extracellular accumulation of excitatory amino acids in the rat hippocampus. J Neurochem 1992; 58: 1730-1735. Avila JC, Santiago AP, Amâncio RT, Galina A, Oliveira MF, Bozza FA. Sepsis induces brain mitochondrial dysfunction. Crit Care Med 2008; 36: 1925-1932. Pytel P, Alexander JJ. Pathogenesis of septic encephalopathy. Curr Opin Neurol 2009; 22: 283-287. Sumi N, Nishioku T, Takata F. Lipopolysaccharide-activated microglia induce dysfunction of the blood-brain barrier in rat microvascular endothelial cells co-cultured with microglia. Cell Mol Neurobiol 2010; 30: 247-353. Berg RM, Taudorf S, Bailey DM. Cerebral net exchange of large neutral amino acids after lipopolysaccharide infusion in healthy humans. Crit Care 2010; 14: R16. Kafa IM, Uysal M, Bakirci S, Ayberk KM. Sepsis induces apoptotic cell death in different regions of the brain in a rat model of sepsis. Acta Neurobiol Exp 2010; 70: 246-260. Wong ML, Licinio J. Localization of interleukin-1 type I receptor Mrna in rat brain. Neuroimmuomodulation 1994; 1: 110-115. Lee SC, Liu W, Brosnan CF. Cytokine production by human microglia and astrocytes: differential induction by lipopolysaccharide and IL-1β. J Immun 1993; 150: 2659-2667. Cai Z, Pang Y, Lin S. Differential roles of tumor necrosis factor-α and interleukin-1β in lipopolysaccharide-induced brain injury in the neonatal rat. Brain Res 2003; 975: 37-47. Sharshar T, Annane D, de la Grandmaison GL. The neuropathology of septic shock. Brain Pathol 2004; 14: 21-33. 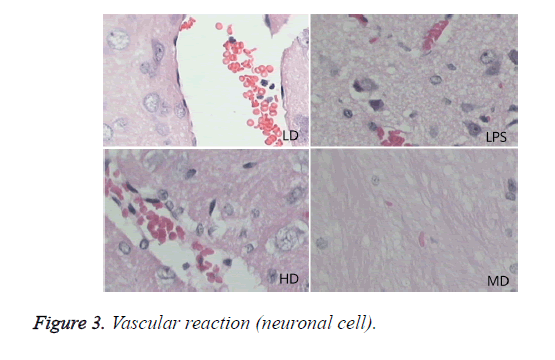 Sharshar T, Gray F, Lorin de la Grandmaison G. Apoptosis of neurons in cardiovascular autonomic centres triggered by inducible nitric oxide synthase after deah from septic shock. Lancet 2003; 362: 1799-17805. Finelli PF, Uphoff DF. Magnetic resonance imaging abnormalities with septic encephalopathy. J Neurol Neurosurg psychiatry 2004; 75: 1189-1191. Kirsten M, Gitte IS, JesPer Q. Cerebral blood flow and oxidative metabolism during human endotoxemia. J Cereb Bloodd Flow Metab 2002; 22: 1262-1270. Papadopoulos MC, Lamb F J, Moss RF. Faecal peritonitis causes oedema and neuronal injury in pig cerebral cortex. Clin Sci 1999; 96: 461-466. Spaolsky RM, Romero LM, Munck AU. How do glucocorticoids influence stress response? Integrating permissive, suppressive, stimulatory, and preparative actions. Endocr Rev 2000; 21:55-89. Carlet J. From mega to more reasonable doses of corticosteroids: A decade to recreate hope. Crit Care Med 1999; 27: 672-675. Cronin L, Cook DJ, Carlet J. Corticosteroid treatment for sepsis: critical appraisal and meta-analysis of the literature. Crit Care Med 1995; 23: 1430-1439. Chadda K, Annane D. The use of corticosteroids in severe sepsis and acute respiratory distress syndrome. Ann Med 2002; 34: 582-589. Xu RB. Effects of diminution of glucocorticoids receptors in spinal shock—a new hypothesis. Chinese Bull Life Sci 1997; 9: 78-80. Ma J, Jing BW, Yang XY. Observation of glucocorticoid receptors in leukocyte and plasma cortisol of patients with multiple organ failure. Chinese Crit Care Med 1995; 7: 371-373. Bellingham JC, Sar M, Cidlowski JA. Ligand-dependent down-regulation of stably transfected human glucocorticoid receptors is associated with loss of functional glucocorticoid responsiveness. Mol Endocrinol 1992; 6: 2090-2102. Webster JC, Jewell CM, Bodwell JE. Mouse glucocorticoid receptor phosphorylation status influences multiple functions of the receptor protein. J Biol Chem 1997; 272: 9287-9293. Ortí E, Bodwell JE, Munck A: Phosphorylation of steroid hormone receptors. Endocr Rev 1992; 13: 105-128. Basler T, Meier-Hellmann A, Bredle D. Amino acid imbalance early in septic encephalopathy. Intens Care Med 2002; 28: 293-298. Liu YJ, Song LN, Lu J. Regulating effect of glucocorticoid on expression of α and β mrna of glucocorticoid receptor. Chinese J Pathophysiol 2002; 18: 243-246. Huh JW, Choi HS, Lim CM. Low-dose hydrocortisone treatment for patients with septic shock: a pilot study comparing 3 days with 7 days. Respirology 2011; 16: 1088-1095. Li C, Xu J, Yuan Y, Zheng L. Effect of hydrocortisone sodium succinate on serum tumor necrosis factor-α and interleukin-10 in septic shock. Zhonghua Wei Zhong Bing Ji Jiu Yi Xue 2014; 26: 513-515.